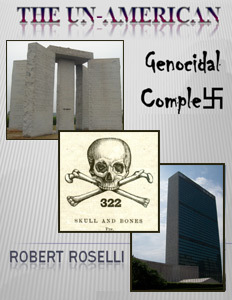 Rob Roselli is the author of this amazing expose of American foreign policies and plans that have negatively affected the world and USA citizens. Global interests from Skull and Bones of Yale, Bohemian Grove, The WorldWatch Institute to IMF International Monetary Fund, the Federal Reserve to the NYC United Nations, have brough havoc and evil to America and the World, and all its citizens. He shows how these globalist satanists and billionaires have planned population reductions, sterilization, genocides, and reducing the health and longevity and IQ of Ameicans and peoples of Earth.